Hubei Province lies in the middle reach of the Yangtze River with an area of 186,000 square kilometers. Situated 108'21"-116'07" east longitude and 29'05"-33'20" north latitude, it got its name from being in the north of the Dongting Lake. The terrain of Hubei Province is high in the west and low in the east and wide open to the south, the Jianghan Plain. The province neighbors Henan Province to the north, Jiangxi and Hunan provinces to the south, Anhui Province to the east, Sichuan Province to the west and Shaanxi Province to the northwest. It is divided into 1 autonomous prefecture, 12 prefecture-level cities, 24 county-level cities, 39 counties, 2 autonomous counties and one forest district, with a population of 60.28 million as of 2000, mainly including ethnic groups of Han, Tu, Miao, Hui, Dong, Manchu, Zhuang, and Mongolian. An important feature of Hubei food is its blending of fish with other ingredients, including Steamed Blunt-Snout Bream, Dried Sheets of Bean Curd, and Boiled Dumpling, etc. Han Opera, Chu Opera, Huangmeixi (opera-style), acrobatics, and the art of singing and storytelling such as Pingshu, Dagu, etc. 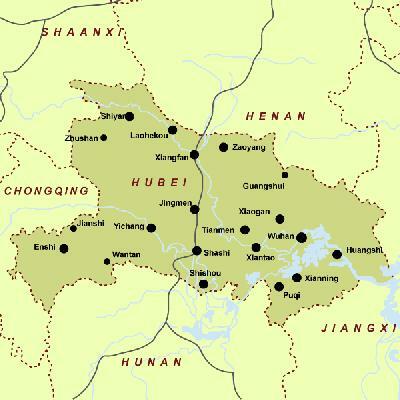 Hubei Province is called E for short, with Wuhan as its provincial capital. It is rich in agriculture, forestry and hydropower resources. Agriculture and fishery are well developed in Hubei, with such main products like paddy rice, wheat, ramie, cotton, silk, tea, orange, fish, and vegetable oil, the outputs of which are among the top of the country. Its main industries include iron and steel, machinery, power and automobile. Renowned as the Province of a Thousand Lakes, Hubei abounds in natural, historic and cultural resources. The main places of historic interest and scenic beauty include the Three Gorges of the Yangtze River, the East Lake and the Yellow Crane Tower in Wuhan, ancient Longzhong (a strategic place of importance in ancient time) in Wuhan City, the Temple of Emperor Yan in Suizhou, the Hometown of Quyuan in Zigui, Wudang Mountain (famous for martial arts), Jiugong Mountain and Shennongjia (a place of primitive forest), etc.